Foodborne infection, also referred to as food poisoning, can be a very serious and challenging experience. The Centers for Disease Control and Prevention estimate than one out of every six the people in the United States experiences illness or infection caused by the consumption of contaminated foods each year. This accounts for millions of cases, and results in 128,000 hospitalizations, and 3,000 deaths. 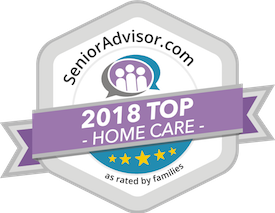 As a family caregiver, it is important that you are prepared to give them the care they need so they can heal as well as possible, and move on in a healthier and safer way. If your parent is suffering severe symptoms, is disoriented or experiencing symptoms of severe dehydration, or contracted the illness from seafood or mushrooms, contact emergency medical personnel. Discourage your parent from eating solid foods until they have stopped vomiting. Start with simple, bland, easy-to-digest foods such as bananas, rice, bread, mashed potatoes, or similar items. Encourage your parent to sip liquids slowly and gradually. This has been shown to reduce the risk of vomiting. Don’t allow your parent to take any type of medication without first consulting their doctor. Some can make foodborne infections worse. Encourage plenty of clear fluids to prevent dehydration, especially if your parent is dealing with vomiting or diarrhea. Consider encouraging your parent to drink an electrolyte beverage if they have suffered diarrhea or vomiting for 24 hours or more. Encourage your senior to get plenty of rest. The services of an elderly care provider can be valuable at helping your parent accomplish this by handling tasks such as managing household tasks, doing laundry, meal preparation, and running errands. Pay close attention to your senior’s condition and symptoms, and get in touch with their doctor if they do not get better, or show severe signs of dehydration or other symptoms. If you’re aging loved one has recently been diagnosed with a new medical condition, has been experiencing greater or more difficult symptoms, has developed more challenges, or you simply believe they would benefit from diversified care, now may be the ideal time for you to consider elderly care for them. An elderly home care services provider can step in when it is best for your senior, and for you, to fill care gaps, provide supportive, dignified, and respectful management of potentially sensitive care needs, help your parent with activities of daily living, and encourage them to stay more active and independent as they age in place. If they are coping with an illness, this care provider can provide medication reminders, remind your senior to follow through with treatments and other guidelines, and provide care and assistance that will allow your parent to conserve their energy, get the rest they need, and focus on healing and moving forward.